We have reached an amazing milestone, for the first time in our five year history, we are awarding $100,000 in college scholarships in a single year! This includes $15,100 raised through our Generosity Campaign. Thanks to the generous contributions of supporters like you, our Advisory Council, the generous grant from E4FC, and the Generosity community, eleven more students will be able to pursue their dream of attending college. This year, we are pleased to honor two incredible members of the AEF family, Cristela Alonzo and Chef Ronaldo Linares by naming two of our scholarships in their honor. The Cristela Alonzo Resiliency Award, and the Ronaldo Linares Perseverance award have been awarded to two AEF scholars who fully embody the meaning of the words resilient and perseverance. Both Cristela and Ronaldo made outstanding contributions to our annual gala and gave generously of their time and talents. 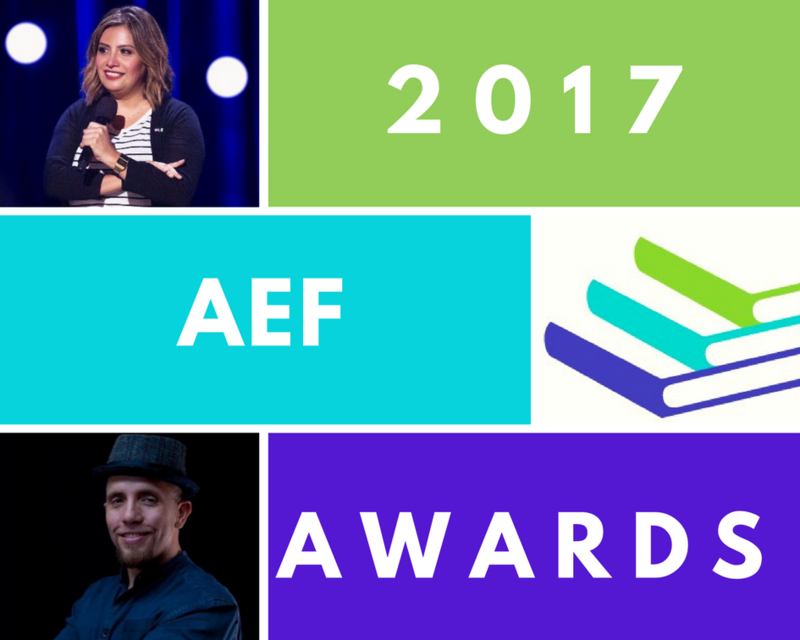 We are thrilled to introduce our eleven 2017 AEF Scholars! Our eleven 2017 AEF Scholars embody the diverse immigrant community in New York City and represent Bangladesh, China, Gambia, Guatemala, Indonesia, Mexico, Nepal, and Togo. Take a moment to read each of their extraordinary stories below. A young woman from Gambia who escaped child marriage and immigrated to New York at the age of 13. She is passionate about raising awareness about global sexual violence and has raised funds for organizations that relocate girls from dangerous and unstable communities. Her participation in the Barnard College STEP Program and the MedDocs Program have inspired her to study medicine and women’s studies. Despite her hardship and arriving just four years ago, she is ranked at the top of her senior class and plans to attend Barnard College in the fall. The enthusiastic energy from our 2017 scholar from Togo is infectious. Her first encounter with English was at customs when she landed at JFK, and yet she speaks English with great fluency in the 3 years she’s been in the US. Despite the many hardships and violence she faced in her home country and the US, she is a rising pre-med student attending Skidmore College. Her goal to become a doctor stems from the lack of medical assistance her family received in her country. This Amin Family Educational Scholar dreams of one day going back to build a stronger medical infrastructure in her community. This scholar’s path through life has been enormously difficult: her path from Mexico to the US, family home incidents, and the death of a close friend. She managed all of these stresses and a part time job where she works 23 hours a week while attending high school full time. Therapy and counseling were the driving force of her ability to cope and stay on task. This Sofia India Amin Educational Scholar is inspired to provide the same help she was given by majoring in Psychology and Counseling when she attends Queensborough Community College in the fall. A young woman from Nepal who immigrated to the United States six years ago. The last two years she has interned as a youth activist with the New York Civil Liberties Union and since then donates half of her check to fund a year’s worth of school supplies for disadvantaged children in Nepal. When she was bullied because of her accent, she sought out alliances with the LGBTQ community and helped raise awareness on acceptance and inclusion. She is proud to serve as a mentor to her younger sister, and has learned to overcome her own challenges with hard work and building confidence. This Sanchez Alzate Community Scholar plans to attend Rensselaer Polytechnic Institute and study business management or computer science. A young woman from Bangladesh who immigrated to New York as a young child. In middle school faced with a lack of resources available to navigate the competitive educational system, she founded her own non-profit to provide resources to underserved low-income students, including tools for high school admissions, SAT prep and a network of mentors with similar backgrounds. She is active in organizing protests against anti-Islamic rhetoric and violence, and she thrived in a career development program, The Opportunity Network. Her family has also faced hardship with her father becoming physically disabled and her mother suffering from spinal injuries. She is passionate about dance and will attend Barnard College in the fall, focusing on entrepreneurship and economics. A young man who emigrated from Mexico at the age of six and has always loved physics and math. He earned an engineering internship with Con Edison which allowed him to gain experience working on New York City’s electrical distribution system and a project focused on building stronger electrical equipment post Hurricane Sandy. He dreams of being in a position to influence and be part of technological change in order to improve the lives of people everywhere and also inspire more Latino students to pursue a STEM education. This Raj and Bhavini Amin Educational Scholar plans to pursue a degree in electrical engineering or applied physics at New York University. For this scholar originally from China, her pursuit of the American Dream began only three years ago when she and her mother were forced to seek political asylum in the U.S. In that short time, she has endured two high schools across two different states, while also learning a new language and applying to colleges. Dedicated, resilient, and passionate about accounting, she hopes to one day have her own firm to provide financial literacy and accounting to immigrants and those without traditional access to such resources. This Momentum Realty Acquisition Scholar plans to study accounting and will enroll at Stony Brook University this fall. A Guatemalan immigrant with a passion for food, who worked part-time in restaurants to help her family while attending high school and maintaining her high GPA. She is one step closer to her dream as an occupational therapist after getting accepted to the College of Mount Saint Vincent. She sought help and didn’t receive it from teachers who were neglectful of students at her under-resourced high school, so she looked to the internet and the library to help teach herself and others. What is our 2017 Ronaldo Linares Perseverance Award scholar most proud of? Helping tutor another fellow immigrant student achieve good grades in math. This 2017 scholar moved to the country at 15 years old from Bangladesh; she arrived merely two days before her first day at high school and was initially teased and made fun of. Through sheer will, she learned English and ascended to become student Vice President her senior year. Her first initiative as student body VP? Create a buddy program to help newcomers to the US to better adjust to their new environment. Her love of math and science has led her to declare her major in civil engineering at City College of New York. A young woman from Mexico, this scholar came to the U.S. as a small child and has overcome many challenges as an immigrant. She has dedicated herself to assisting her community via workshops that help promote financial management, civic engagement, leadership development, and higher education for immigrants. She is a Sponsors for Educational Opportunity scholar who was selected for a summer program with Franklin & Marshall College. With her bubbly personality and outgoing attitude, she pursues her passions, which include acting, karate, and cross-country running. This Cristela Alonzo Resilience Award Scholar plans to pursue a career as a doctor and will enroll at Binghamton University this fall. Born in Indonesia and immigrated to the U.S. as a 2 year old, this scholar would come to call Queens his home. After gaining admission to the competitive Stuyvesant High School, he did nothing but excel in and outside the classroom, including serving as an active member of the peer mentorship and guidance program. With near perfect SAT scores and a rigorous course load, he still found time to become the president of his school’s dance team where his love for hip hop and dance showcases flourished. As an immigrant, he has accepted the numerous challenges and doesn’t stop pursuing the activities that make him happy. This scholar is passionate about pursuing a career as a teacher and will enroll at Stony Brook University this fall. We would like to thank our Selection Committee for reading over 440 applications, and interviewing 19 finalists before selecting 3% of our applicants as the 2017 AEF Scholars. Thank you for all of your contributions, including your time and financial commitments. Together, we are elevating our community through higher education and significantly improving these young persons’ lives. This entry was posted in News by AscendAdmin. Bookmark the permalink.